The Sun heaves out a load of space weather that can impact the Earth. Shown here is the Sun's outer atmosphere — known as the Corona — taken by instruments onboard the National Oceanic and Atmospheric Administration's GOES-13 spacecraft. BOULDER, Colo. — Space science research is having a major impact on our daily lives.It is also an enterprise that can provide a solid framework for globalcooperation in an uneasy world. Universities are a sparkplug in fostering spacescience research — crucibles of creativity to harness interdisciplinary thinking for problemsolving. Experts took part in a special panel"Forging the Future of Space Science: The Next 50 Years," held here April14 at the University of Colorado's Laboratory for Atmospheric and Space Physics(LASP). The discussion is part of aninternational public seminar series, marking the 50th anniversary of theInternational Geophysical Year that launched science into space. The colloquia seriesis organized by the Space Studies Board, a research arm of the National Academyof Sciences. Walter Scott, Founder and ChiefTechnical Officer of Digital Globe based in Longmont, Colorado, spotlighted theenormous changes in satelliteremote sensing. He detailed the expanding applications for the next generationsof high resolution imaging — a far cry from spysat technologies first utilizedin the 1960s. Scott pointed to trends incommercial satellite remote sensing: better resolution, increased accuracy,more bandwidth, and greater coverage of the Earth - in far-shorter time fromclick to customer. The ubiquity of satellite remotesensing in our daily lives, Scott said, is moving quickly, mimicking use of electricityand the Internet. James Watzin, Director of SpacePrograms at ATK Space, took a hard look at NASA, indicating that the spaceagency appears to have "lost its customer." While NASA celebrates 50 years ofprogress this year, Watzin said there's need for public dialogue to cast thecivilian space agenda in more necessary and relevant terms. NASA faces avulnerable state of paralysis, he suggested, striving to send humans to Marswhile dealing with tight budgets, issues of mission affordability andrisk-taking. Watzin signaled that NASA needs todo the most exciting and compelling things that the country's best andbrightest people can possibly conceive of. NASA needs to be allowed by allstakeholders to take more risk and have much more payoff. Watzin is a former project managerfor the LunarReconnaissance Orbiter at NASA's Goddard Space Flight Center in Greenbelt, Maryland. 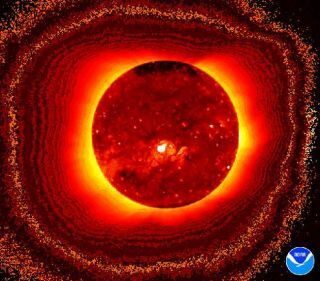 Progress is being made on assessingthe impact of space weather on systems, as well as humans, said Rodney Viereck,Chief of the Space Weather Services Branch at the National Oceanic andAtmospheric Administration's Space Weather Prediction Center in Boulder. Still, "there's heavy relianceon very sparse data," Viereck noted, with the customer base for spaceweather data growing. Viereck said there are diverseimpacts of space weather on today's technology, from communications,navigation, and spacecraft operations to aviation, as well electric powergrids. There is a beginning ability tocomputer model in three-dimensions the complex nature of space weather, Vierecksaid. The coupling of various space weather models is in the offing, he added. In the years to come, Viereck said,public access to space will bolster the need for better space weatherforecasting. Given the number of spaceports being planned, he said, bothorbital space tourism and point-to-point suborbital passenger travel will meanincreased use of space weather services. Developing a globally-engagedscience and engineering workforce is a priority of the National ScienceFoundation's Office of International Science and Engineering (OISE), saidCynthia Singleton, a policy fellow at OISE in Washington, D.C.
Singleton reflected upon the role ofscience diplomacy, also reviewing the research and development dollars beingspent in China,Europe, Japan, Canada, as well as Saudi Arabia. Those expenditures should givepause to those that ponder a key question: Will the U.S. remain a global leaderin technology and innovation? OISE funds international research and education activities in avariety of science disciplines, Singleton said. Doing so helps to open upaccess to research talent and research facilities beyond U.S. borders, she explained. Daniel Baker, Director of LASP saidthat universities are now — and will continue to be — regional centers ofintellectual leadership and technological innovation. "Universities should, well intothe future, be the neutral sites, or 'safe zones,' where industry, nationallaboratories, and academia can feel secure to meet, exchange ideas, try newapproaches, and create," Baker told SPACE.com. Baker explained that leadinguniversities will build mountains of development and economic growth in the "FlatWorld" — drawing from the popular 2005 book of Thomas Friedman, TheWorld Is Flat: A Brief History of the Twenty-First Century. The world of tomorrow will be farmore interdisciplinary and multidisciplinary than today, is Baker's forecast.Universities must fully embrace that fact, he said, in teaching, learning andresearch. Furthermore, successful universitiesmust increase "in every possible way" hands-on education and trainingopportunities, Baker said. Space research can be a majorvehicle of learning and power, Baker advised. "Through space research,universities should be funded to form strategic partnerships with key Chinese,Indian, European, and Latin American universities." Baker emphasized that through sharedcampuses and extensions, space science and engineering has "more potentialto build peace and friendship than any other theme." Space science should begin now toencourage, and to drive, the strong interactions of humanities and socialsciences with the premier technical components of space research, Baker said.Taking that approach, he felt, can provide continued strength and leadershippotential for space exploration in the world of tomorrow. There's need to "takeuniversities to the world ? and bring the world to universities," Bakerconcluded.